Fort Fisher State Recreation Area is located in New Hanover County five miles south of Carolina Beach. From Raleigh, take interstate 40 east. Follow 421 through Wilmington over the bridge all the way to the end of the island. Turn left into the state recreation area on Loggerhead Road. 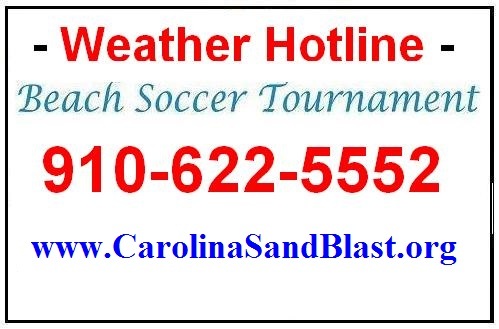 From Brunswick County take Hwy 74/76 across the Cape Fear Memorial Bridge or come across the Southport-Fort Fisher ferry, which crosses the Cape Fear River. After exiting the ferry, turn right onto Loggerhead Road. Parking and the visitor's center are to the left. Park in designated areas only. 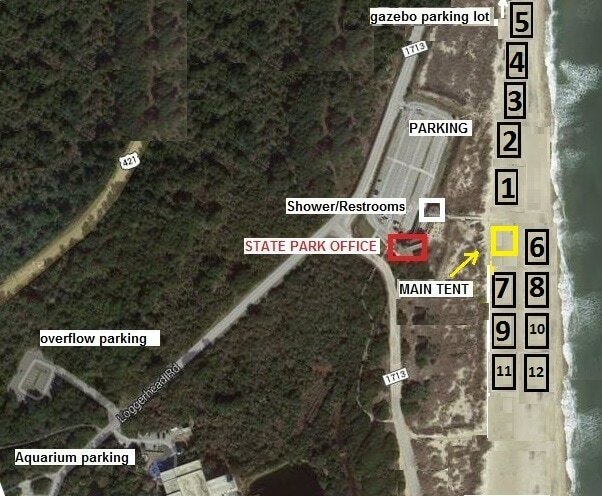 Additional parking located at the NC Aquarium and north of the park at the gazebo. Highly recommend dropping off passengers/tents/coolers at the beach entrance prior to finding parking. Tents must set-up on the ocean-side of the fields keeping the center isle between fields open for foot traffic and spectators for games. Teams line-up on the dunes-side, and the center isle for fields 6,8,10,12.